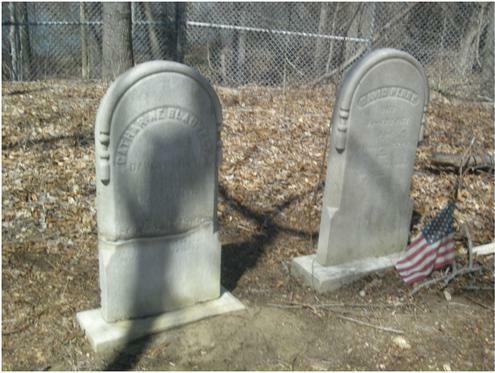 The Perry Cemetery is situated in the Borough of Harrington Park on Old Hook Road, east of Bogerts Mill Road opposite the United Water Company building. David Perry had devised by his will, signed on July 18,1868 that: “the burying ground where the same now is, westerly of my dwelling house, of the use of 40’ square, I give unto all my children to be kept by them and their posterity as a place of burial forever.” When David wrote his will, his great-grandson Perry Cole (1866-1867) and grandson Henry Perry (1854-1867) already had been buried in the small plot. By the end of 1871, 6 members of the Perry family had been laid to rest within yards of the family house. The last burial at the cemetery was that of David’s great-grandson, Claude Yeomans (1887-1940). There are a total of 12 people interred at the Perry Cemetery. IN l Memory of l PERRY l son of Nicholas & l Catharine Ann Cole l who Died Sept. l 4th, 1867 l Aged 1 Yr 1 Mo l & 27 Days. l --- l Alas, how chang'd that lovely l child. That twined around l our hearts. God has took him. CATHARINE BLAUVELT l Wife of l DAVID PERRY l DIED l Aug 23, 1894 l Aged l 81 yrs 5 mos 28 dys l The last enemy that shall l be destroyed is death.